Graphene market earns the tag of being one of the most dynamic and fastest-growing markets of all times, contingent on the fact that graphene is one of the most remarkable and widely-used materials ever discovered. Graphene is already being used in numerous end-use sectors, and is currently being experimented with, to detect the various other energy-related applications it can be deployed for. Research & development activities play a crucial role in the development of graphene industry, with scientists and academicians striving to discover novel methods of incorporating graphene in various methodologies. As per statistics, the number of research publications on graphene has increased to over 9000 in 2013 from over 125 in 2005. Speaking along the same lines, a recent news snippet reveals a significant milestone that may revolutionize the graphene market. The Fraunhofer Institute of Electron Beam & Plasma Technology (FEP), based in Dresden, along with the British Aixtron Ltd. and Spanish company Graphenea S.A., has achieved a remarkable success by developing OLED electrodes from graphene, which can be used in a range of applications, from medicine to photovoltaics. Sponsored partly by the EU Commission, which contributed around EUR 12.4 million to the project, these products are likely to be commercialized within a couple of years. These graphene electrodes will be designed to be highly tough and flexible, and will be used in polarization filters, touch screens, transmission regulator in windows, medicines, and high-tech textiles. Graphene is also likely to assure a successful future for light-powered wireless connectivity. Graphene industry held a valuation of USD 20 million in 2016, subject to the product applications across the aerospace & defense, electronics, automotive, energy, and healthcare sectors. Over the years, the substance has found utilization in wireless connectivity, solar cells, OLED electrode production, etc., thereby helping graphene market share to increase at a phenomenal rate, with an estimated target valuation of USD 200 million by 2024. Graphene is one of the thinnest and most transparent materials. It is unbelievably flexible and tough. The material is extremely light and around 200 times stronger than steel. It is an excellent conductor, deeming it suitable for electronics applications. Graphene industry is slated to extensively proliferate the electronics sector in the ensuing years, given its numerous properties. The substance is also likely to penetrate the energy storage sector. Prominent graphene applications that may gain precedence in the following years include wearable technology, lightweight aircraft, durable, partly transparent, and flexible cell phones, electric car, and more. The sector is likely to emerge as one of most opportunistic avenues for investors, given the extensive scope of the electronics industry. Statistics state that electronics was one of the most dynamic end-user segments of graphene market in 2016, having held more than 30% of the overall share in the year, subject to the product’s strength & conductivity. Electronic devices mostly incorporate graphene nanoplates and graphene oxide. The former is considered as one of the most vital products encompassed by graphene industry, since it exhibits characteristics such as thermal conductivity, surface hardness, stiffness, electrical conductivity, etc. Estimates claim graphene nanoplates to have held more than 30% of the overall graphene market share in 2016. With an extensive utilization scope across myriad sectors, electronics being one of key ones, graphene industry size from graphene nanoplates may very well carve out a profitable growth curve over 2017-2024. Electronic applications such as mobile memory chip production, touch screens, semiconductors, and computer circuitry, extensively deploy graphene, thereby augmenting the reach of global graphene market in electronics, especially across the Asia Pacific. The region, as per analysts, has been experiencing a profound growth in the electronics sector, which is bound to act as the principal driver for the development of graphene industry. As per estimates, Asia Pacific graphene market recorded a valuation of USD 3.9 million in 2016. With the extensive presence of graphene companies, electronics companies, graphite mines, and even renowned automakers, APAC graphene industry is anticipated to register a CAGR of more than 34% over 2017-2024. Also, the extensive R&D activities being conducted across Japan, South Korea, India, and China, in addition to the presence of huge graphite mines in China, will serve to increase the scope of APAC graphene market. While APAC is undoubtedly one of the ripe regions for investing in graphene industry, the globally developed continent, North America, stands to serve as a lucrative avenue as well. The region, as per statistics, has been forecast to cover more than 40% of the overall graphene market share by 2024. The continent is an omnipotent as far as the development of the electronics, biotechnology, aerospace, and automotive sectors are considered. Besides, the manufacturing sector across the continent has been undergoing a change lately, with expert technological advances proliferating the same. North America boasts of the massive presence of major electronic and material companies, which engage in constant mergers & acquisitions and product innovations. It is no doubt that this belt is likely to be one of the most lucrative business grounds for graphene industry in the course of the next few years. Bearing testimony to the aforementioned prediction is the recent move by Elcora Advanced Materials Corp., a vertically integrated graphite & graphene company, to commence the development of non-toxic, anti-fouling graphene coatings. As per reports, the company plans to develop a range of graphene-enhanced marine coatings to reduce fuel consumption of vessels and reduce the growth of marine organisms. The move is expected to provide a positive impetus to the regional graphene market, which is slated to grow at a CAGR of 35% over 2017-2024. Speaking of coatings, renowned UK-based firm, Applied Graphene Materials has entered into a partnership with HMG Paints to commercialize graphene-based coatings for numerous industries. It is expected that the two firms, post the testing phase, will launch their products in the real world, across commercial vehicles and commercial equipment, which will eventually widen the application scope of graphene industry. Some of the other renowned names in this fraternity include Graphenea S.A., Grafoid Inc., XG Sciences, Inc., Graphene Frontiers LLC, ACS Materials LLC, Advanced Graphene Products, Haydale Limited, Applied Nanotech, Inc., Angstron Materials, Inc., Nanjing XFNANO Materials Tech Co., Ltd, Thomas Swan & Co., Graphene Laboratories, Inc., and AMO Gmbh. Graphene-based coatings are also used extensively in the aerospace & defense sector. 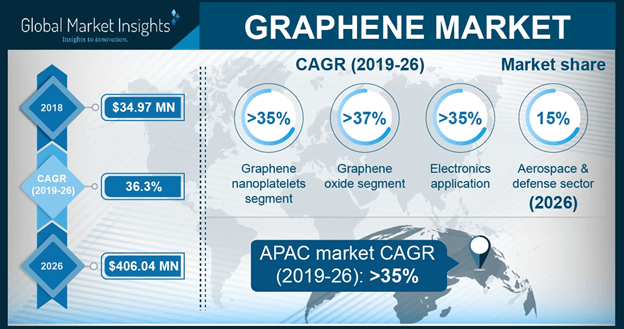 As per a graphene market research report, this segment is likely to account for over 15% of the overall revenue share by 2024, growing at a rate of 35% over 2017-2024. These coatings ensure minimum toxicity, increased equipment lifespan, strength, thermal properties, and lubricity, which will spur the use of graphene for aerospace, and by extension, augment the growth of graphene industry. Scientists have long since awaited the use of an able material that can effectively replace silicon. With the advent of graphene, it would seem as though their efforts have paid off. Though the fact that single-crystal graphene is just a few centimeters in size may restrict the growth of graphene market, the fact that researchers have been attempting to produce a larger version of single-crystal products will act as a favorable growth driver for graphene industry.